Political stances on science often get overlooked during debates and news reports. However, issues like climate change, space exploration, vaccinations, and science education have a major impact on our daily lives. As the Executive Branch has a big influence on public policy, it's vital to be aware of how White House cabinet members feel about various issues of concern to the scientific community. Regardless of your personal political views, it's important to stay informed. How US politicians approach scientific issues varies greatly. Hotly debated topics like global warming, vaccinations, creationism in the classroom, and more are often cause for embittered political squabbles. Perspectives on science can influence public policy and certain issues should be of concern to us all. When it comes to topics such as climate change, for example, some people feel our very ability to continue to live on the planet is at risk. To learn more about the Trump administration's stance on science, read this list! On evolution: While Mike Pence never overtly said he doesn't believe in evolution, he implied as much during a 2009 Hardball interview with Chris Matthews. When pressed repeatedly on whether he believed in evolution, Pence responded with a series of cryptic statements such as, "I believe with all my heart that God created the heavens and the earth, the seas and all that is in them." On global warming: Mike Pence believes the science is mixed on global warming. On smoking cigarettes: Mike Pence does not believe that smoking kills, once stating, "Despite the hysteria from the political class, smoking doesn't kill." However, he does believe that the habit is not good for people. On science education: Pence has not spoken out against teaching science in schools, but does believe creationism should be taught alongside things like evolution. On climate change: Rick Perry is skeptical that manmade activity is responsible for climate change. He's made various statements on the subject over the years, including saying, "I just happen to believe that, you know, the earth’s temperature has been moving up and down for millenniums now and there are enough scientists skeptical about the reasons for it." On evolution: During his 2011 bid for the republican presidential nomination, the Texas Freedom Network put together a summary of Perry's beliefs. Speaking about evolution, the primer stated the then governor recognizes evolution is a theory. While he never stated overtly he does not believe in evolution, Perry once said in a newspaper interview, "I am a firm believer in intelligent design as a matter of faith and intellect." On science education: Perry believes intelligent design should be taught in schools. However, he also believes that other theories - including evolution - should be taught as well. On the big bang theory: Ben Carson has called the big bang theory "ridiculous." He once stated in a speech, "You have all these highfalutin scientists, and they’re saying that there was this gigantic explosion and everything came into perfect order." On evolution: Carson has implied that Darwin's theory of evolution was the work of the devil. He has stated, "I personally believe that this theory that Darwin came up with was something that was encouraged by the adversary, and it has become what is scientifically, politically correct." On vaccines: Carson does not believe that vaccines and autism are related, but he does think that the shots are administered in too short of a time frame, stating, "And a lot of pediatricians now recognize that and I think are cutting down on the numbers and the proximity in which those are done and I think that's appropriate." On evolution: Betsy DeVos seems to believe that intelligent design should be taught alongside science-based evolution. On science education: DeVos has made statements regarding funding for Christian schools, saying, "There are not enough philanthropic dollars in America to fund what is currently the need in education... Our desire is to confront the culture in ways that will continue to advance God's kingdom." 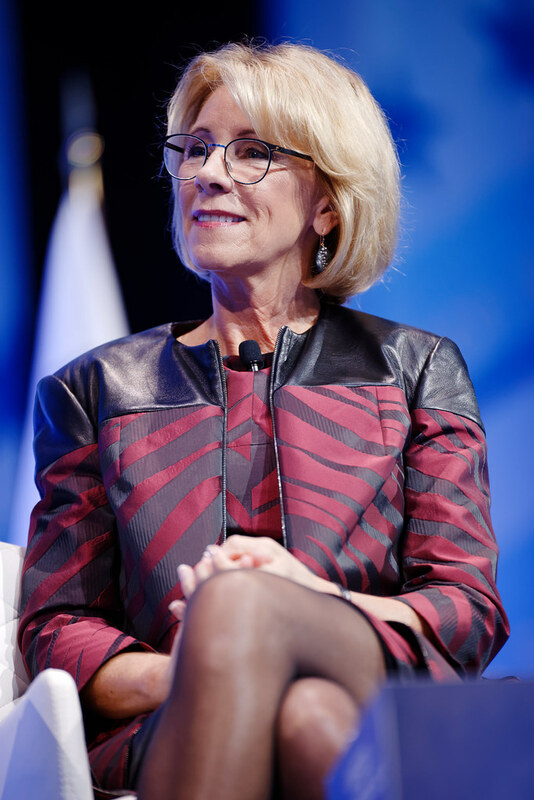 While it's unclear what this statement meant precisely, those who strongly oppose DeVos took it as an implication she may advocate teaching religion in public schools or using federal funds for Christian schools. On climate changes: DeVos's views on climate change remain unclear. While she praised Donald Trump for withdrawing from the Paris Climate Accord, the investment management firm she operates has invested in clean technology. She has frequently declined to speak openly about climate change during interviews.